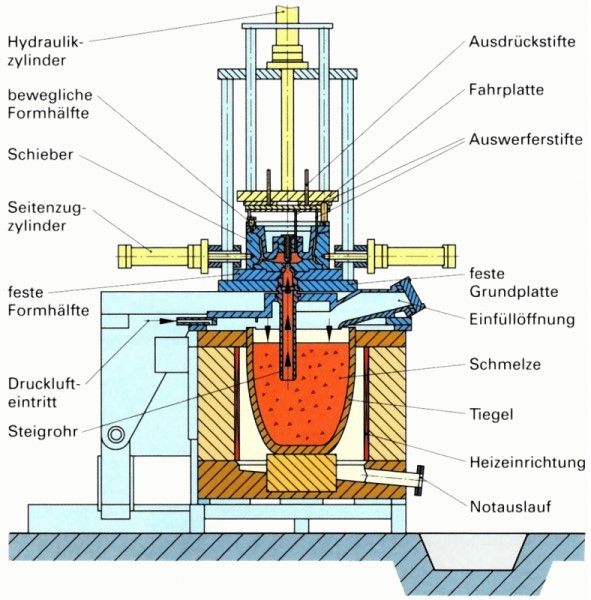 Casting process in which the melt is poured from a pressurized pouring furnace via a riser tube into a permanent mold (die). This process is mainly used in the production of light metal castings, particularly those made from aluminum casting alloys (see Low pressure casting plant) but also those made of magnesium alloys (magnesium low pressure casting plant) with a casting weight of around 1 to approx. 70kg. However, there are also plants for heavy metal casting (brass casting). This process is widely used in the production of aluminum wheels. The production of castings with complex designs is possible using the low pressure casting process, examples are: crankcases, cylinder heads, pump casing and chassis parts. The metal die is on the top of the holding furnace and pouring furnace which is closed and air-tight and is connected to the furnace via a riser tube. Fig. 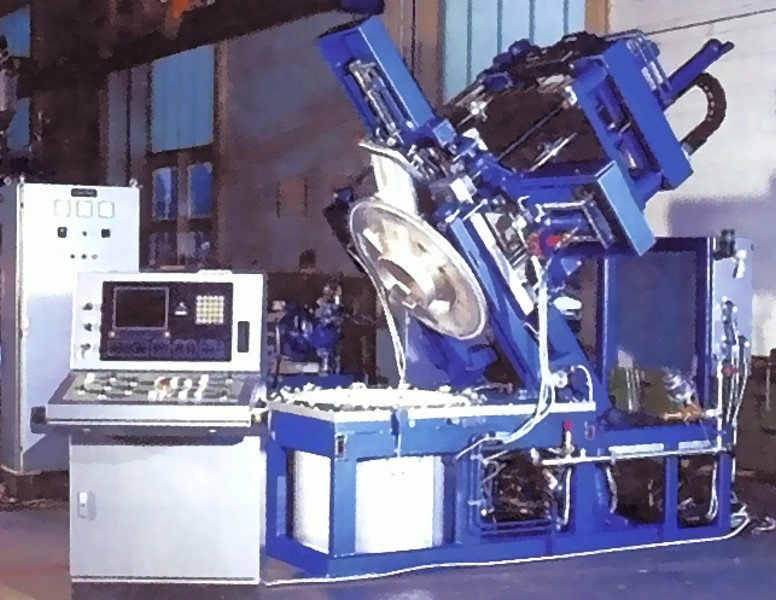 1 shows the design of a low pressure gravity die casting unit. By pressurizing the furnace with air or an inert gas with relatively low overpressure (usually from 200 to 1000mbar), the melt rises up in the riser tube and fills the mold cavity from underneath. 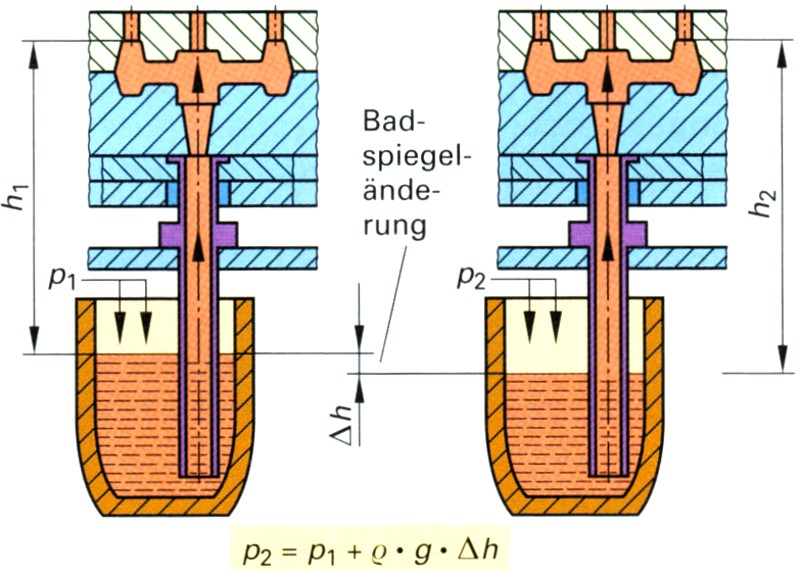 The overpressure is maintained until the casting has solidified or the solidification in the gate nozzle is complete (pressure pattern in Fig. 2). 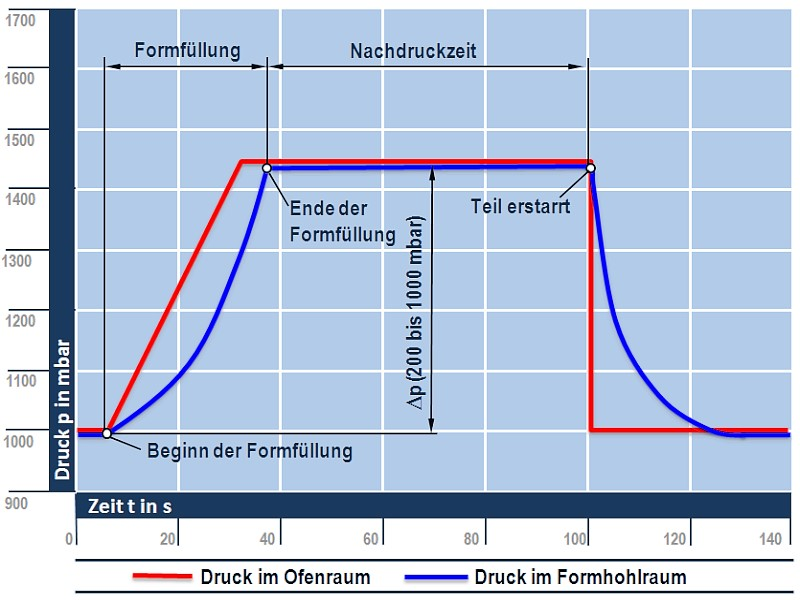 The length of the solidification time is dependent on the casting and must be determined on a case-by-case basis through suitable measurements with temperature sensors near to the location in which the casting finally solidifies or the solidification time can be estimated relatively precisely with a solidification simulation. 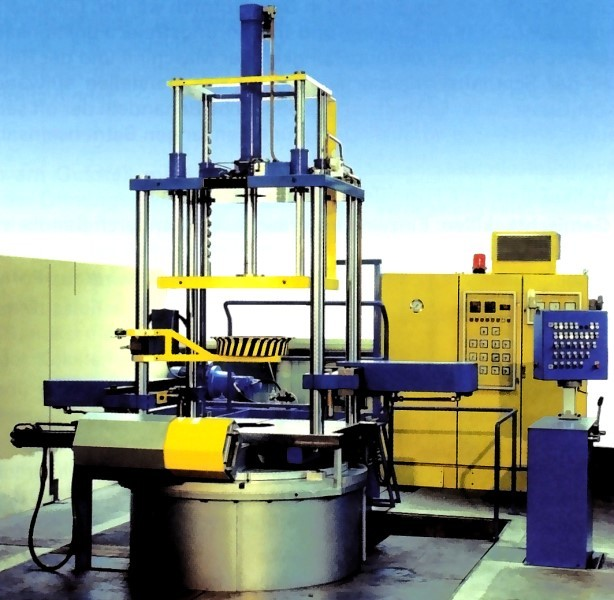 The particular advantage of this process lies in the fact that the riser on the casting becomes completely unnecessary in places as, theoretically, the filling pressure is maintained until the finished solidification. However, this requires the melt to be separated from the solidified sprue in exactly the right place. In order to ensure sufficient reliability, the riser tube is fitted with a conical narrowing in the upper area and, through additional heating of the part of the riser tube underneath this narrow part, it is ensured that the solidification does not progress downwards and block the riser tube. Usually, in addition to this, the gate area of the die above the upper end of the riser tube is cooled (Fig. 3). The liquid metal flows back into the furnace after the pressure is reduced. 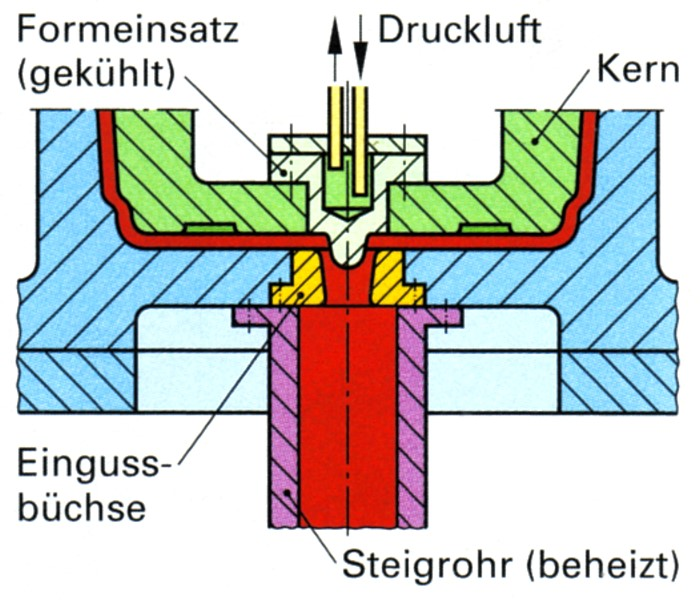 The bath level must be continuously monitored or compensated for with a computer, as the casting conditions change due to the sinking of the metal level and the correction of the filling pressure is therefore necessary (initial pressure, Fig. 4). Due to the principle of the process, the use of dies whose main parting planes are horizontal is particularly appropriate. The casting table serves as a fixed fixing plate for the lower half of the die on the side where the sprue is and is part of the closing unit. The upper, movable half of the die is fixed to the movable driving plate and is applied and removed hydraulically by the closing cylinder. The casting is ejected from the upper die by the ejector mechanism and falls onto a table which can be swiveled between both halves of the mold. The entire closing unit can be titled hydraulically in most machines and this makes it easier to access the holdingcrucible and riser tube (Fig. 5). An entire low pressure casting plant is shown in Fig. 6. Variations of the low pressure die casting process are the counterpressure casting process and the precocast process. Through the increased and smooth filling of the mold, oxide and gas inclusions can be largely avoided, as long as the ventilation is designed correctly. Ventilation is carried out via the clearance in the mold inserts and the mold parting, the ejectors, the cores and sliders and through the use of air vents. If attention is paid to controlled solidification in the constructive design of the casting and the die, risers are not necessary. The low pressure gravity die casting procedure therefore achieves a high material utilization rate which can reach values over 90% in many cases. The use of coated sand cores is possible due to the low overpressures and, through the combination of a die and sand cores, it is possible to design complex shapes. The entire casting process can be automated well.